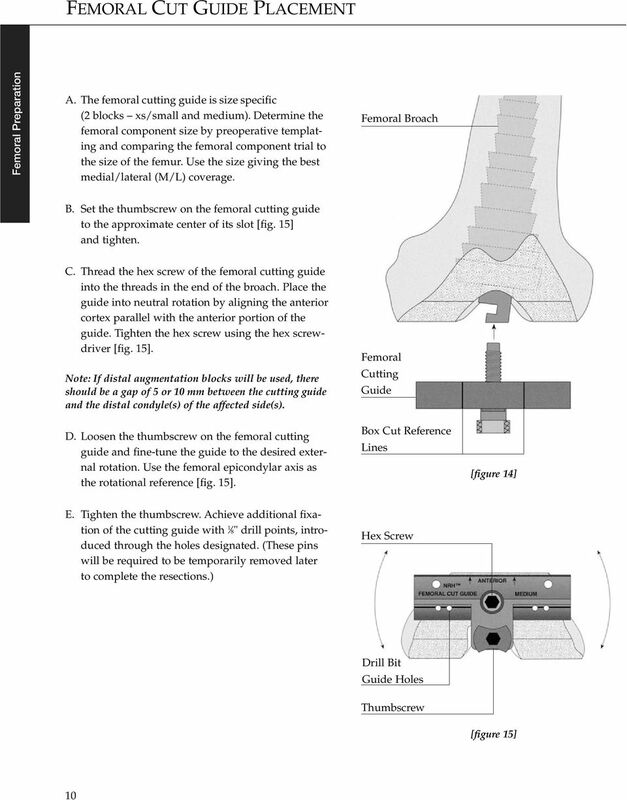 Download "Surgical Technique and Reference Guide"
44 S-ROM MODULAR TOTAL KNEE SYSTEM NOILES ROTATING HINGE KNEE SYSTEM IMPORTANT This essential product information does not include all of the information necessary for selection and use of a device. Please see full labeling for all necessary information. 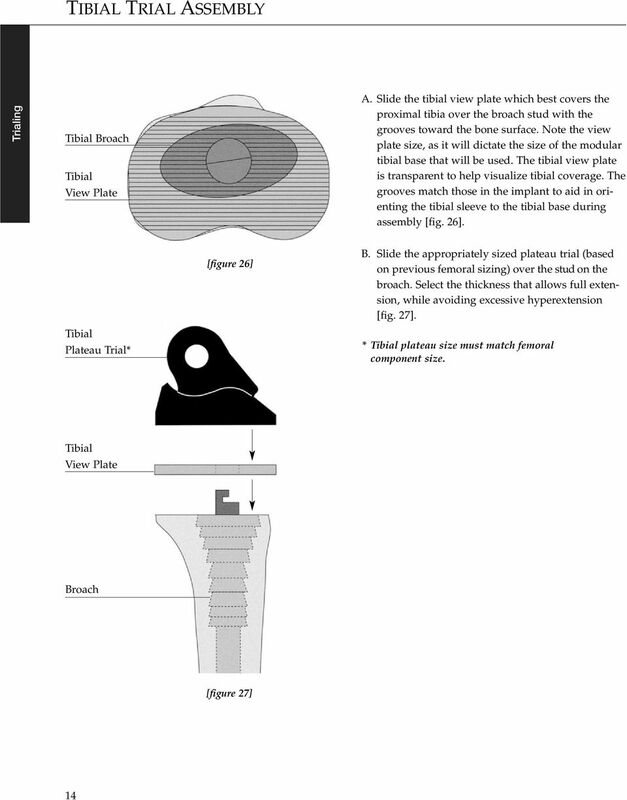 INDICATIONS AND USAGE The Noiles Rotating Hinge Knee is indicated for use with PMMA bone cement in primary or revision cases in patients: who have reached skeletal maturity and for whom the surgeon has decided to resect both cruciate ligaments or whose cruciate ligaments are absent or incompetent and who exhibit insufficiency of lateral/collateral ligaments and other soft supporting tissue due to the following conditions: rheumatoid arthritis, osteoarthritis, post-traumatic arthritis, and arthritis secondary to a variety of diseases and anomalies, failure of a previous knee reconstruction procedure, trauma. CONTRAINDICATIONS Active infection or history of general infections or local infectious disease. Vascular insufficiency, muscular atrophy or neuromuscular disease in the affected limb. Advanced loss of osteochondral structure that would preclude proper fixation of the prosthesis. Tumors of the supporting bone structure, systemic and metabolic disorders leading to progressive deterioration of solid bone support. Drug or alcohol addiction, or limiting neuropathic disease. Skeletal immaturity. Obesity or very active lifestyle that can produce loads on the prosthesis that can lead to failure of the fixation of the device or device itself. Allergic reaction to the implant materials. 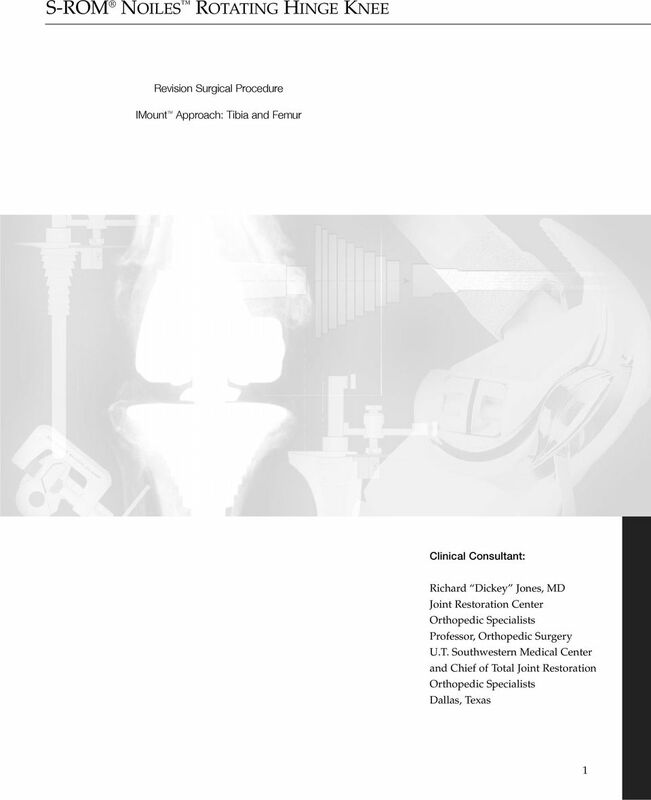 Inadequate flexor and extensor mechanism necessary to achieve a functional prosthetic joint. 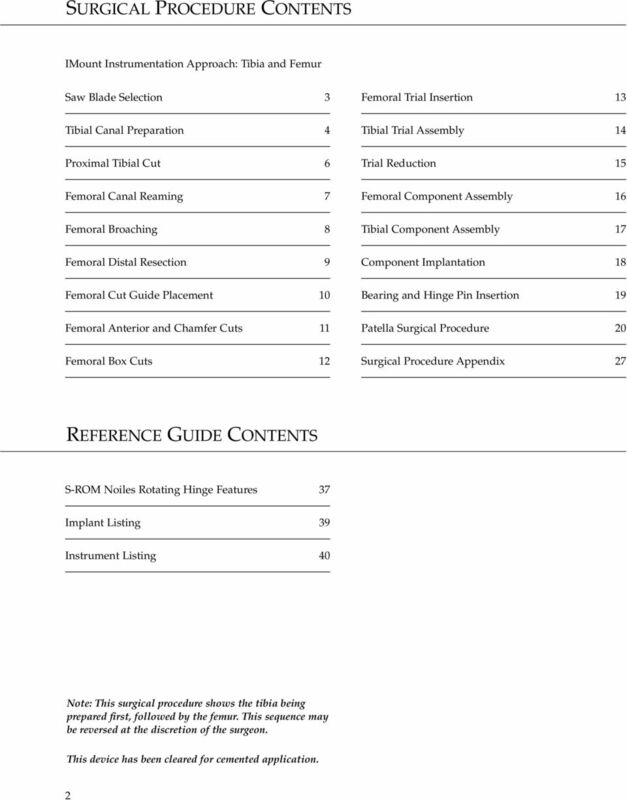 WARNINGS Improper prosthesis selection or alignment, inadequate fixation, use where contraindicated or in patients whose medical, physical, mental, or occupational conditions will likely result in extreme stresses to the implant, may result in premature failure due to loosening, fracture, or wear. 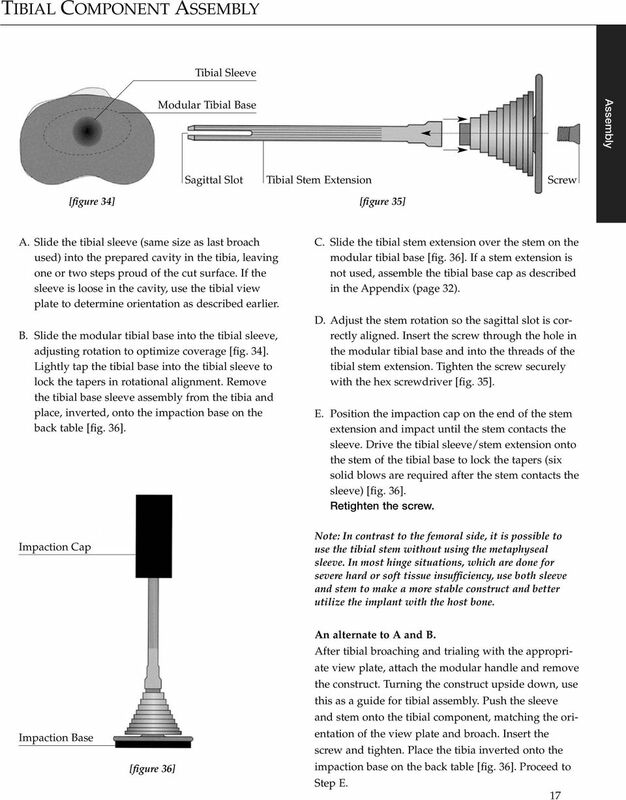 The S-ROM tibial base, tibial sleeve, tibial stem extension, and tibial augmentation blocks may not be used with the Noiles Posterior Stabilized Knee. 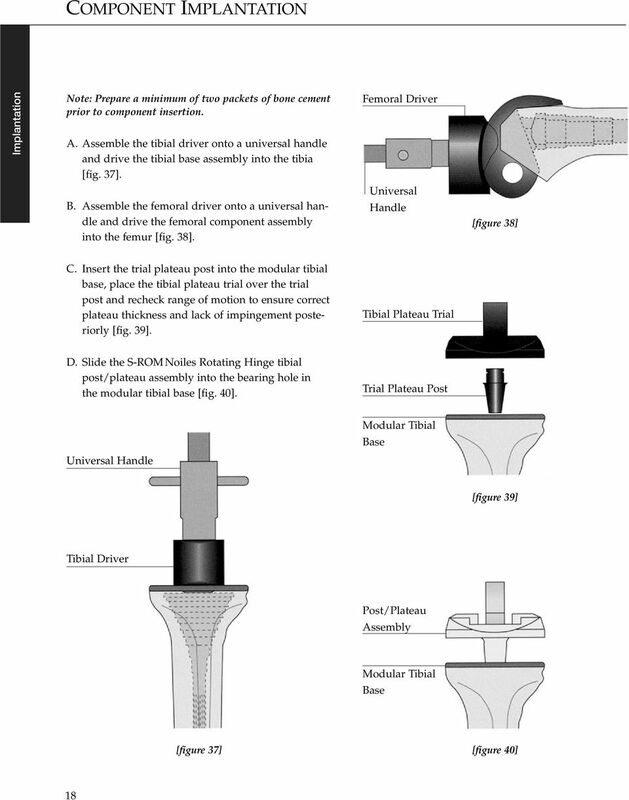 PRECAUTIONS The Noiles Rotating Hinge Knee is designed to articulate from 6 hyperextension to 110 flexion. If, due to grossly inadequate soft tissue integrity, flexion beyond 90 causes luxation of the plateau assembly out of the tibial base, the patient must have a knee brace postoperatively to limit flexion to 90. In such cases, the surgeon should consider closing the wound with the knee in full extension. 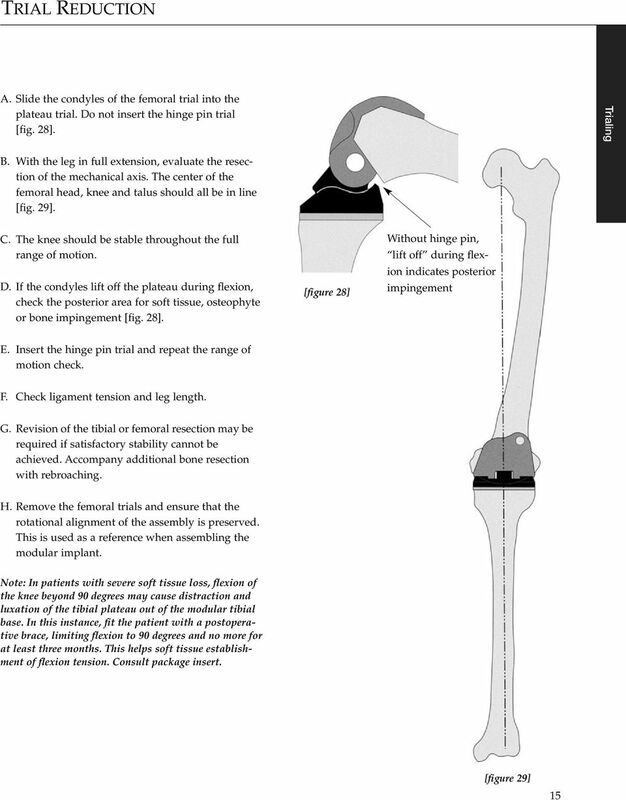 The size of the tibial plateau assembly must correspond with the size of the femoral component. 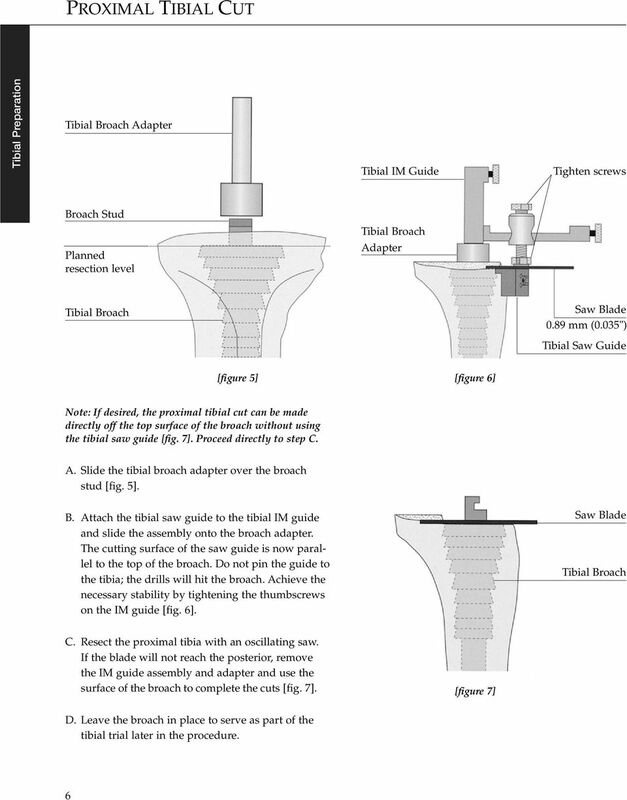 The size of the tibial augmentation block must correspond to the size of the tibial base. 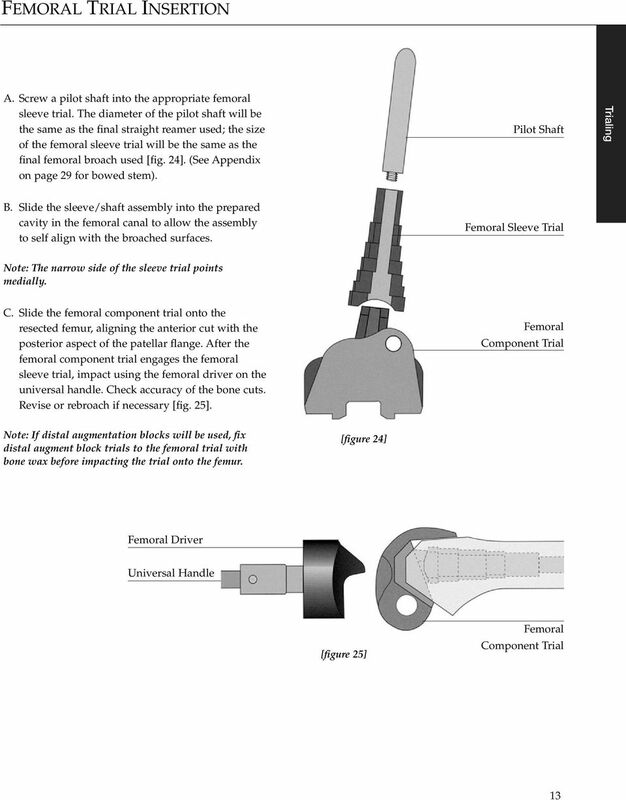 Femoral sleeves are required when using femoral stem extensions. 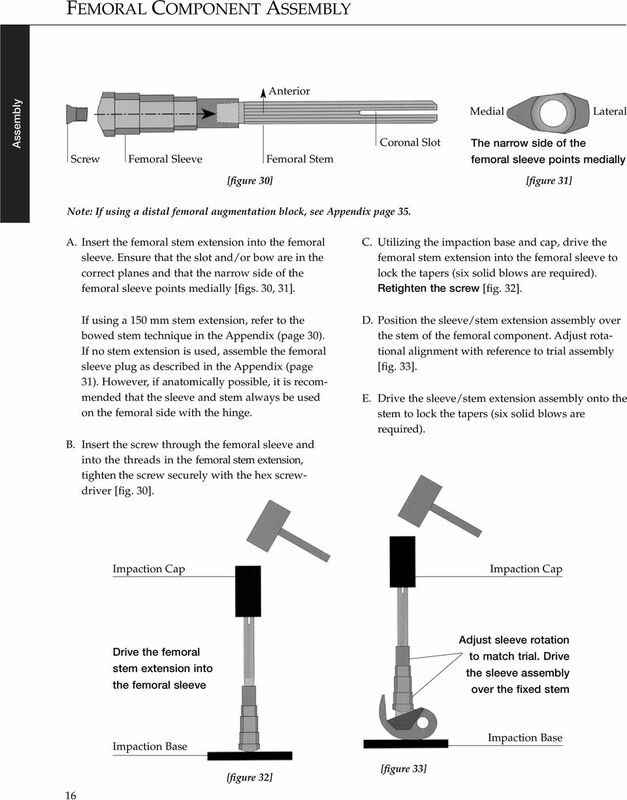 A femoral plug is required with the femoral sleeve when a femoral stem extension is not used. 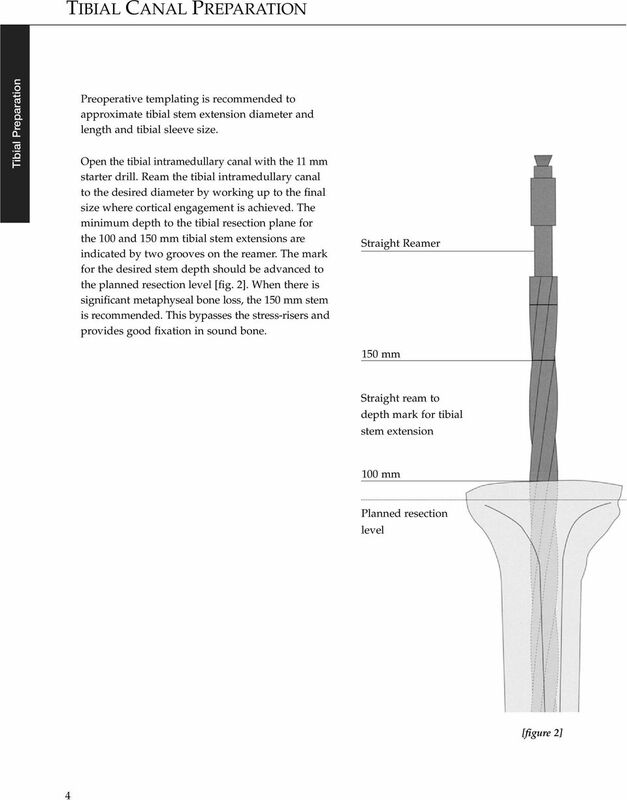 A tibial cap is required with the tibial sleeve when a tibial stem extension is not used. 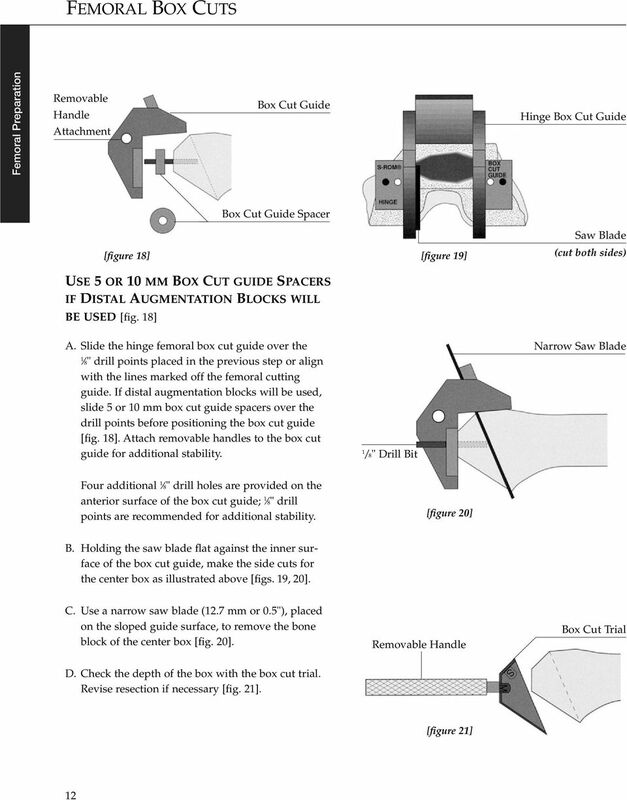 Tibial augmentation blocks cannot be used when tibial sleeves are being used. 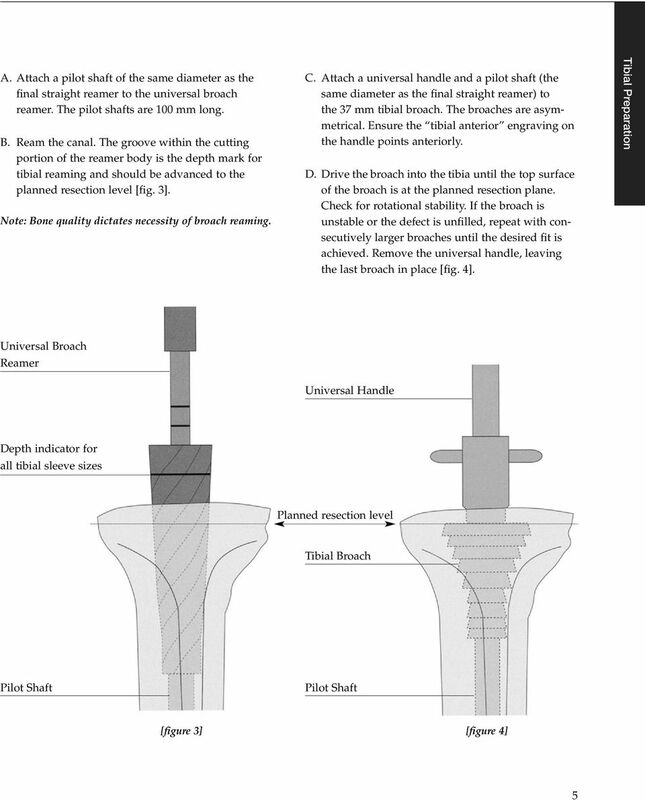 The wear rate of prosthesis contact surfaces is greatly accelerated if loose fragments of bone cement become detached and act as an abrasive in the bearing surfaces. When using bone cement, care should be taken to remove all excess cement from the periphery of the implant. 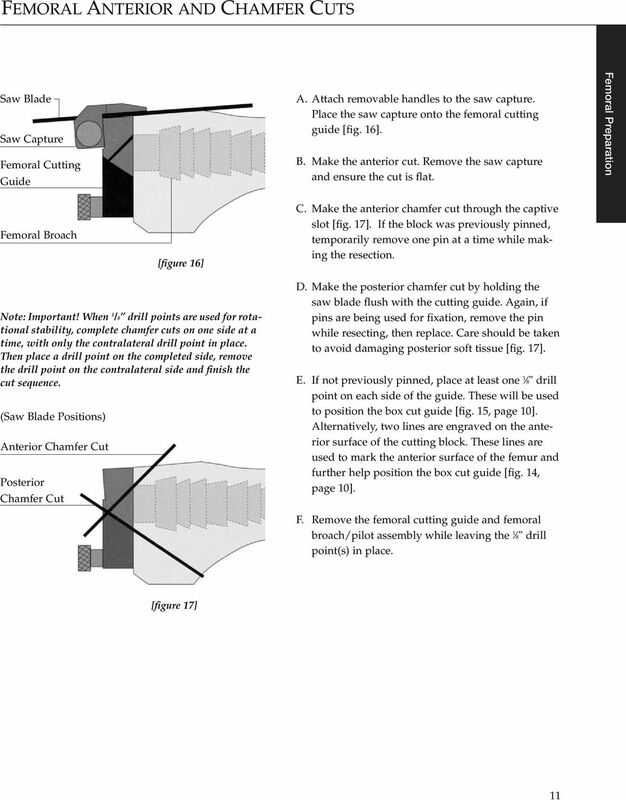 ADVERSE EFFECTS Fracture may occur due to improper preparation of the implant site or if excessive force is used during seating of the implant. Transient peroneal palsy has been reported following total knee arthroplasty, especially after correction of severe flexion or valgus deformities. Patients have complained of persistent pain and stiffness following total knee arthroplasty. In addition, patellar tendon rupture, femoral-tibial subluxation or dislocation, and persistent ligamentary laxity have been reported with the use of total knee implants. Infection and loosening have been reported following total joint arthroplasty, as have wear and failure due to fracture of knee prosthesis components. REFERENCES 1. 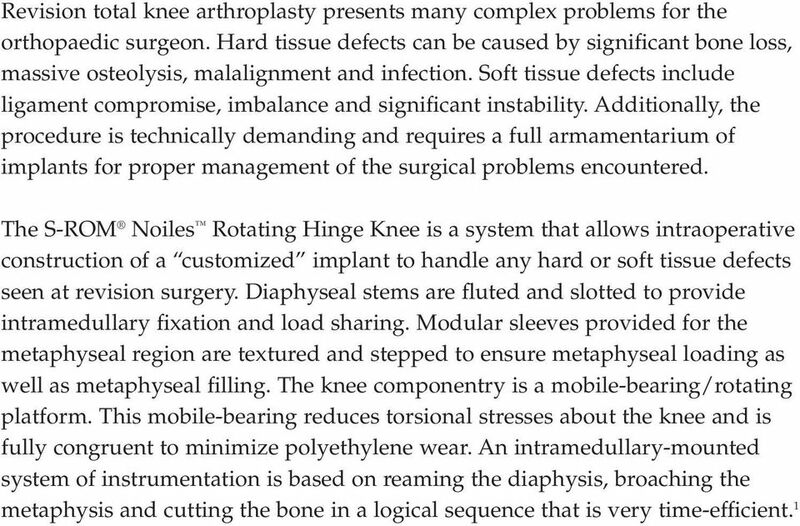 Jones, R. E., Management of the Bone-Deficient Knee Management of Complex Revision Problems with a Modular Total Knee System Orthopedics, Sept. 1996: Jones, R.E., R.L. 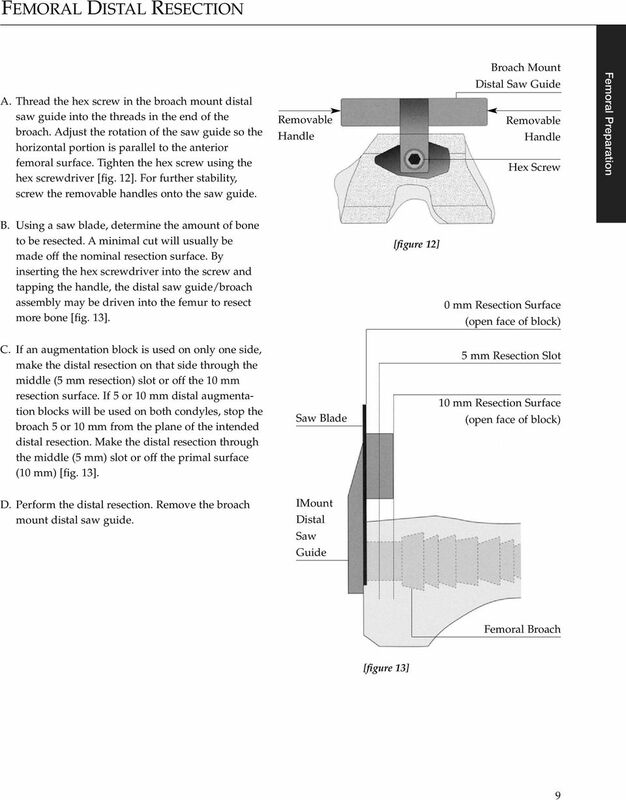 Barrack, Modular, Mobile-Bearing Hinge Total Knee Arthroplasty, Presented at 2001 AAOS. 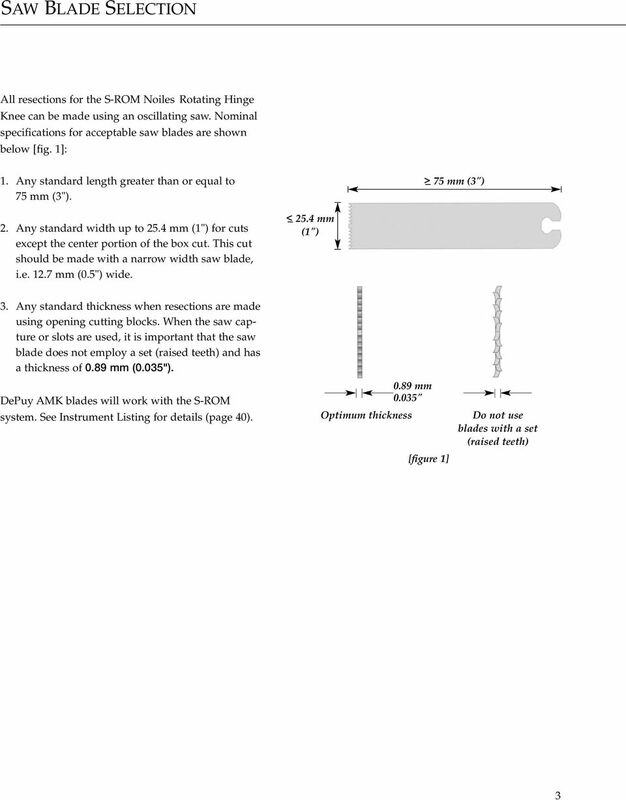 The S-ROM Noiles Rotating Hinge Knee has been cleared for cemented application. 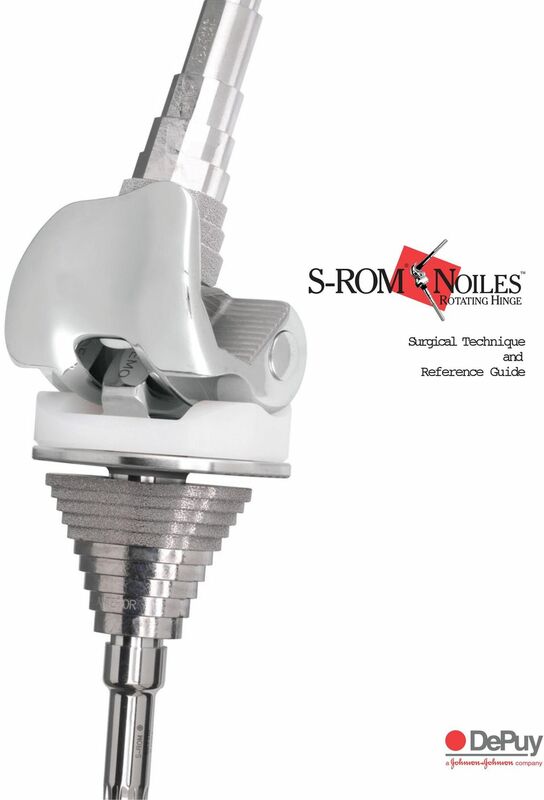 For more information about the S-ROM Noiles Rotating Hinge Knee, visit our web site at 1M (Rev. 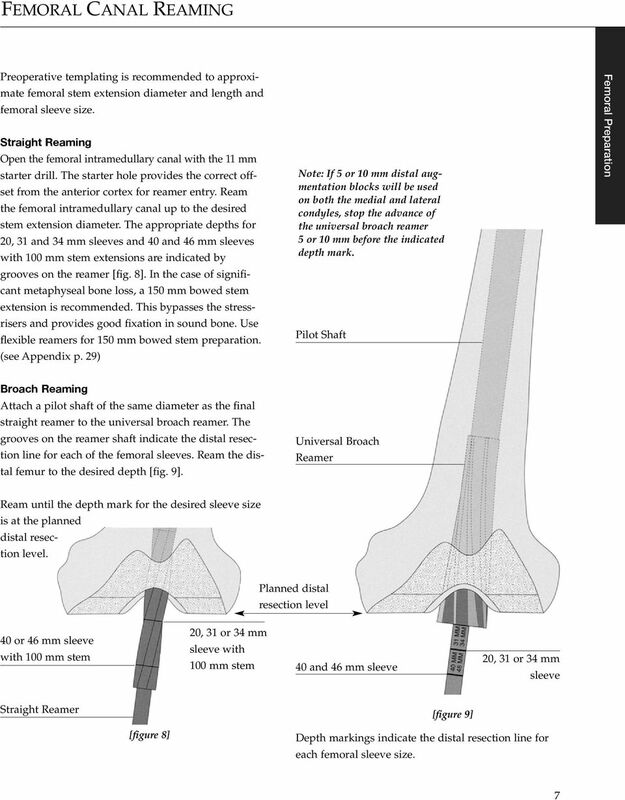 2) Printed in USA DePuy Orthopaedics, Inc. All rights reserved. PARTIAL KNEE SYSTEM. Frequently Asked Questions. MIRROR PARTIAL KNEE SYSTEM Frequently Asked Questions cayennemedical. 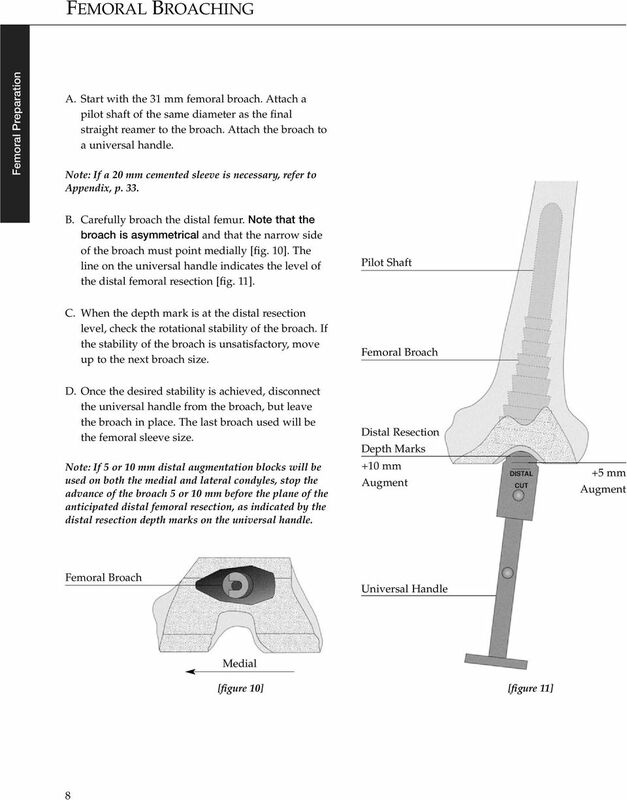 INTUITION INSTRUMENTS SURGICAL TECHNIQUE Introduction This surgical technique provides guidelines for the implantation of the ATTUNE Knee System family of knee implants with the INTUITION Instrumentation. QUESTION I HAVE BEEN ASKED TO REHAB GRADE II AND III MCL INJURIES DIFFERENTLY BY DIFFERENT SURGEONS IN THE FIRST 6WEEKS FOLLOWING INJURY.